Larry K Johnson (b. March 21, 1951), grew up in north central Illinois. He credits his parents with instilling an appreciation for nature, simple beauty and music. He attended St. Bede Academy where he developed an interest in sculpture inspired by his teacher, Rev. Joseph Heyd, O.S.B., who emerged as a mentor and longtime collaborator. Larry enrolled in the BFA program at Fontbonne College in St. Louis, MO. There he served as the studio assistant to Rudolph Torrini, department head, nationally known figurative sculptor, and student of Ivan Mestrovic. After obtaining a Bachelor of Fine Arts in Painting and Sculpture, Larry began graduate studies at the University of Chicago. He was a student of Virginio Ferrari, internationally known sculptor from Verona, and Harold Rosenberg, noted New York art critic and author. Larry continued his graduate studies at Southern Illinois University studying with sculptor Thomas Walsh and Herbert Fink, member of the Louis Comfort Tiffany Foundation. His graduate studies culminated with a MFA in Sculpture. Larry’s early works, primarily figurative, are found in the collections of the Archbishop of Toronto, Southern Illinois University Museum, Illinois Valley College in Oglesby, IL, St. Mark’s Parish in Peoria, IL., Chase Bank in Naperville, IL., Mercy Hospital in Aurora, IL, Holy Guardian Angel Church in Reading, PA., and numerous private collections. Larry’s artistic endeavors were deferred while he pursued a career with IBM lasting for 31 years. He did, however, continue to create a body of work, both sculpture and painting, through the late 1980s. Since his business career retirement in 2010, he has maintained a studio in his home town of Geneva, IL., where he lives with his wife, Mary Jane, and son, Anthony. Major influences throughout Larry’s artistic journey are the works of Henry Moore, Richard Hunt, Giacomo Manzu, Marino Marini, as well as many classical figurative artists. He is inspired by many Impressionist and modern artists as well. His work, derived from and inspired by life forms, is reflective of several recurring themes, namely the emergence of organic elements within the context of structural formats, i.e. columns, monoliths, panels, and religious themes. 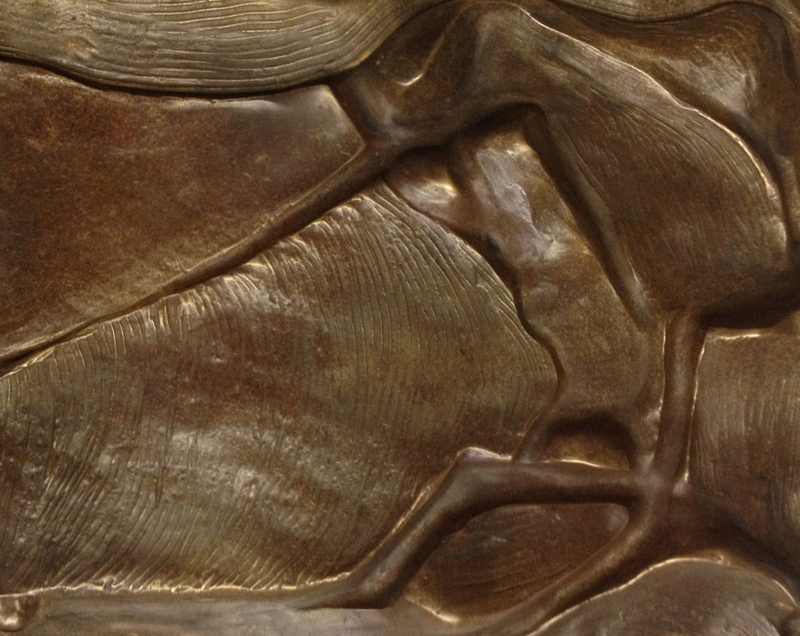 Larry’s current body of work, displayed in his latest exhibit “A Continuum”, bridges his bronze relief work from the late 1980s with his most current work, or porta (i.e. gate, entrance, passage, door, or way) series. These works provide abstract glimpses into evidences of life on many levels including organic lyrical forms symbolic of movement and wing-like, angelic images. He works within a panel format modeling clay and drawing, as if to create a painting in relief. The pieces are later molded and cast into bronze. Not only alluding to figurative elements, his forms reflect insight into elements of life and spiritual vitality. Larry also sculpts portraits and figurative works upon commission or request.